OCQ Wizard - Additional Options - Event 1 Software, Inc. This step is optional and allows you to specify additional options for the query or import. Enter a name for your query here. This name will also be used for the named range that holds the query results in Excel. Excel will modify the name if it is a duplicate or contains illegal characters. 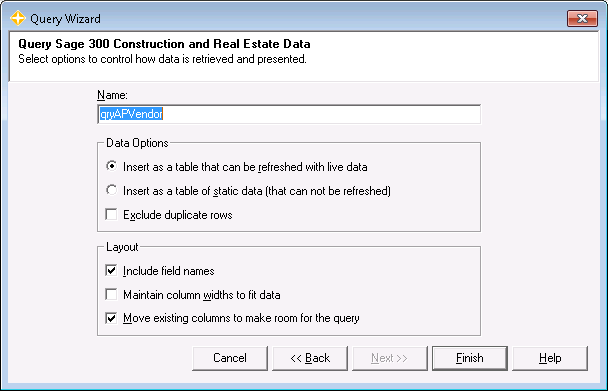 This setting establishes a link to your data that can be refreshed on demand to display the current values. This setting creates a copy of your data that is current as of the time that it is inserted. The data will not be updated when the workbook is refreshed. If this box is checked, then rows are only returned for distinct combinations of values in the selected fields. Check this box to cause Excel to display field names in the top row of the query. Check this box to cause Excel to resize column widths to fit the data every time the query is refreshed. Check this box to make Excel shift existing columns to the right as needed to make room for the query. If this box is not checked, then the query will overwrite any data in its way. Click Cancel to dismiss the dialog without inserting the query. Click Back to go back to the Conditions screen. Next is disabled because this is the last screen on the wizard. Click Finish to insert the query.